Sshhhh, I’m going to share with you my secret recipe stolen from The Cake Mix Doctor. No, come back! It’s really good, I swear! Do you need a fairly no-fuss dessert for a crowd that expects a little more out of life? You’d sooner die than bring anything store bought and yet a boxed mix usually says, “Eh, I’ve stopped trying.” You’ve come to the right place. All of the pizazz, half of the work! The key is to use a quality brownie mix, and Ghirardelli Brownie Mix (Double Chocolate) is the only mix I will use for this recipe. I can’t vouch for awesome results if you decide to buy another brand. Preheat oven to 350 and spray a 13 x 9 inch pan with vegetable oil. Set aside. Place brownie mix, melted butter, water, eggs and vanilla in a large mixing bowl. Stir with a wooden spoon until ingredients are incorporated, about 50 strokes. Pour into prepared pan and smooth out with rubber spatula. Drop raspberry jam by teaspoonfuls onto the batter, and with dinner knife, swirl the jam into the batter. Scatter chocolate chips and pecans evenly over the top. Place in oven. Bake until the outer two inches have formed a crust, 23 to 27 minutes. Remove and cool on wire rack 30 minutes before cutting. When your friends ask, tell them it’s a family recipe from your Mom Mom. 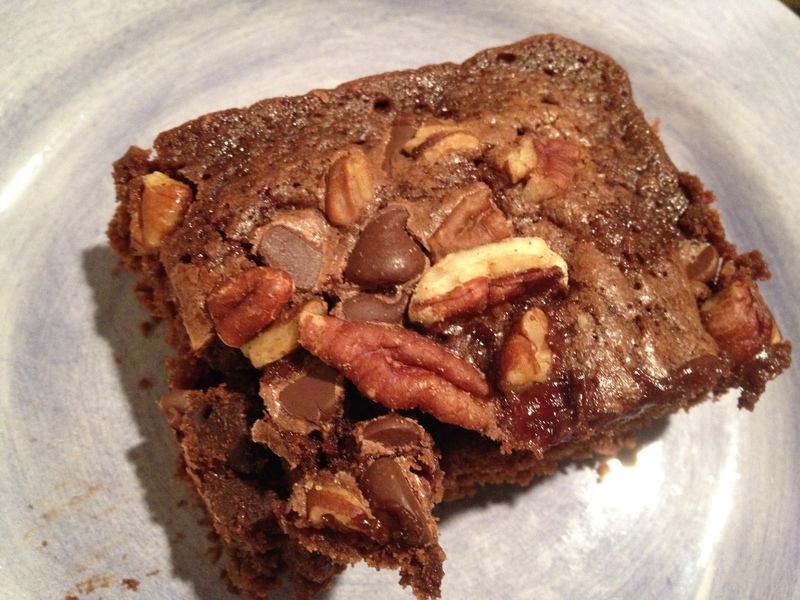 This entry was posted in Desserts and tagged chocolate raspberry brownies by Mom Mom's Apron. Bookmark the permalink. I had these brownies today……………they might have been the best brownies I have ever tasted. I would never have guessed there was any brownie mix involved. Even my mom Wendy who thinks she can tell right away when there has been a mix involved was fooled. Mommom I can’t wait to make them tomorrow, just in time for Thanksgiving. I was so happy to be able to share them with you and Wendy and thrilled you liked them as much as I do. In the interest of full disclosure, the ones you ate today were baked in an 8 x 8 square pan and not a 13 x 9, so they may be a little thicker (and I had to add another minute or two of cooking time). I HAVE made them in a 13 x 9 and they are great that way, too.